When staff and board members at foundations need trusted information about philanthropic practice, there’s one source that tops their list: their peers. In a new, first-of-its-kind study of how U.S. foundations access and use knowledge about effective philanthropy, most foundation staff and board members shared that they rely on their peers and colleagues, as opposed to particular organizations or publications, both as their most trusted knowledge sources and as their preferred means to gather knowledge. External conferences, email, newsletters and grantee interactions are also cited by large majorities as how they most commonly seek knowledge about philanthropic practice. And — perhaps not surprisingly, given foundations’ increasing focus on outcomes over the past few decades – when asked about what aspects of philanthropic practice they want knowledge about, “evaluation and assessment” tops the list, with 44% citing it. 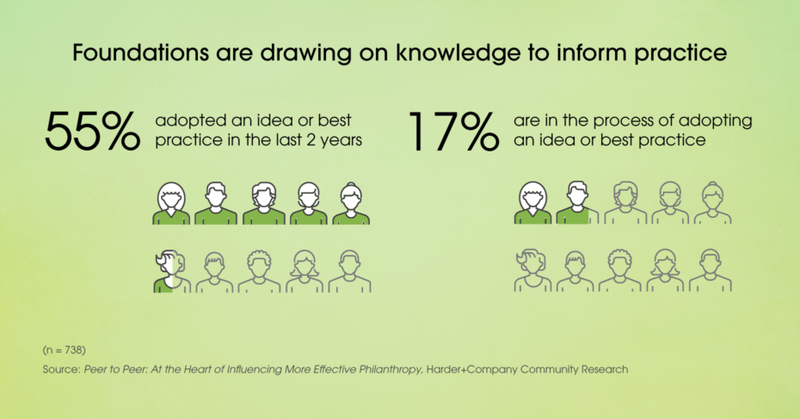 At a time when many foundations are focused on learning, and on sharing lessons to benefit others, this new study conducted by Harder+Company Community Research and Edge Research helps describe how funders are tapping into a knowledge “ecosystem” of researchers, media and peers to inform their thinking and practices. The field scan included a survey of foundation staff and board members with 738 respondents; 75 interviews of a representative sample of foundation staff and board members; and four in-depth case studies. The survey was the first-of-its-kind because 11 of the sector’s major knowledge producers and disseminators collaborated on a shared measurement approach and included their audience email lists in the survey respondent pool. 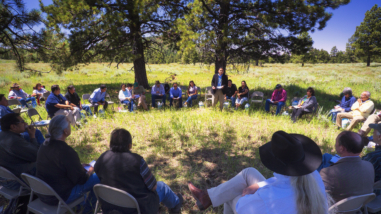 The William and Flora Hewlett Foundation commissioned this research to inform its “Knowledge for Better Philanthropy” grantmaking strategy. When looking to solve a problem or learn about a topic, foundation staff and board members indicated that they first go to a trusted peer or colleague. They also cited peers and colleagues as their most trusted source. Funders described trusted sources as people who are honest, open, and discreet. Trusted sources often have some shared characteristics like working in similar foundation roles or in a foundation of similar size, values, or geography. Interviews further confirm that peer validation is often what helps get knowledge to actually be used inside a foundation. Much of knowledge gathering is informal. For example, funders often phone or email peers at other foundations for advice. They also draw on funder networks and funder gatherings where there are in-person networking opportunities. 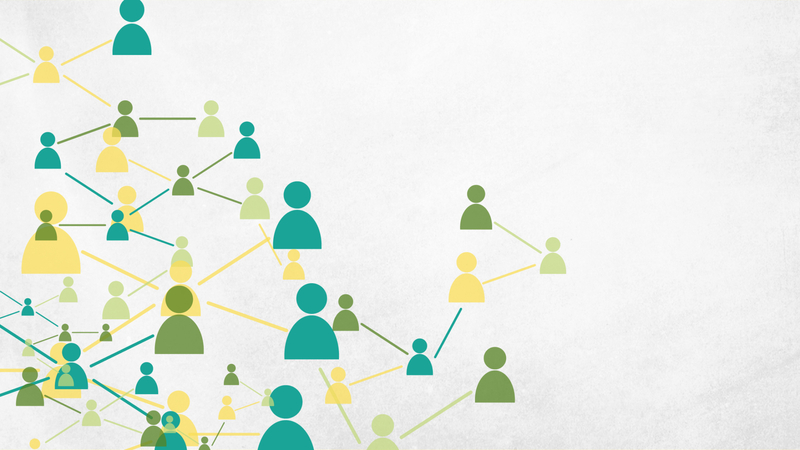 In particular, funders cited regional associations of grantmakers as being helpful in connecting them with one another. Conferences, where peers can interact face to face and select sessions relevant to their work, are also cited by 83% as a “primary way” they seek out information. Fewer than a quarter of foundation staff and board members responding to the survey prefer social media as a method for gathering knowledge. Among those who do seek knowledge about philanthropic practice from social media, more than half (58%) cited Twitter, followed by Facebook (35%) and LinkedIn (25%). Social media may become a more important channel in the future for foundation audiences. Program staff, who tended to be younger, are more likely to use social media than foundation leaders, as illustrated by the fact that 27% of program staff cited social media as a primary way they seek out practice knowledge compared to 17% of foundation leaders. The survey asked funders in an open-ended question about what or who their trusted sources are; no single organization, association or publication was cited as a trusted source by more than a quarter of funders overall. The survey asked about a specific set of organizations that produce and disseminate knowledge. While survey respondents had heard of most major knowledge producers, they tended to be less familiar with what they actually produced. Funders have become more outcome-oriented over the past few decades, but still struggle to effectively measure and understand the results they are achieving. When asked in an open-ended question to list their top three practice knowledge needs, 44% of survey respondents said evaluation and assessment. Many other topics were identified, but all cited by fewer than 15% of respondents. In interviews, respondents expressed a desire for more information about best practices. They want to know what works in different contexts, and spoke about the lack of published best practices. Several funders observed that it’s even harder to find information about what doesn’t work. When we're sitting and looking at a finite amount of money, are we better off spreading it and helping 30 organizations? 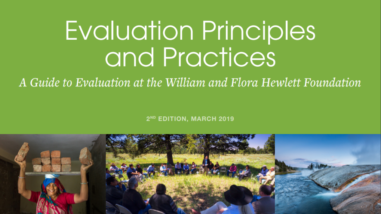 When it comes to evaluation and assessment, specifically, funders said they specifically want for more information about the impact of their grants; a better understanding of why some charitable investments reap results; and more technical assistance around evaluation – different assessment techniques, evaluation at different stages, and a better sense of how evaluation is implemented in peer institutions. The majority of foundation staff surveyed (80%) said they use knowledge to challenge or affirm current practices, or to compare themselves to the field (75%). For all the criticism that philanthropies are slow to change, funders in the study reported making changes in a wide range of areas, including philanthropic models and approaches, standards and ethics, diversity and inclusion, financial stewardship, governance, grantmaking, grants management, and learning and evaluation. More than half of funders (55%) who responded to the survey said they had adopted an idea or best practice in the last two years that was informed by practice knowledge, and 17% are in the process of making a change. 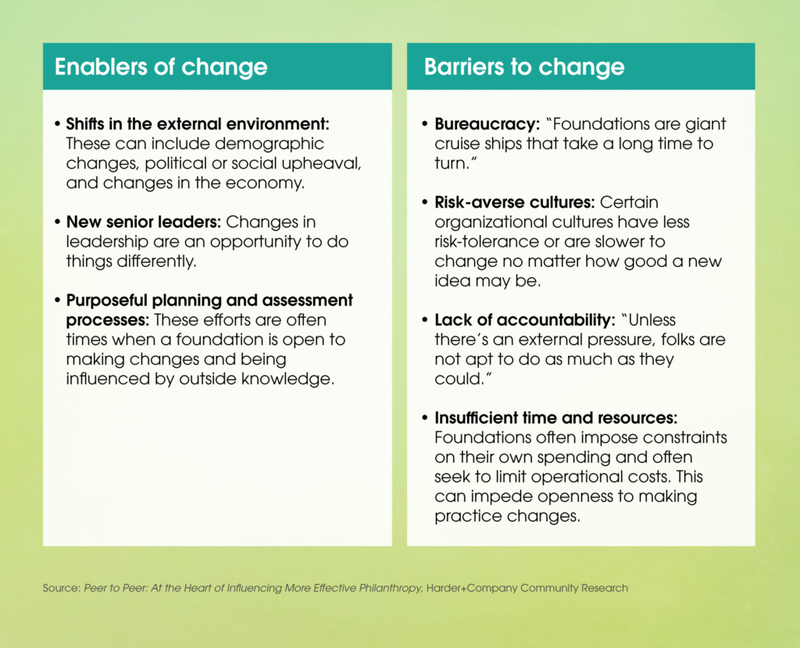 While a majority of funders reported using knowledge to inform their philanthropic practice, many also say they experience “in-box” overload and a sense of being overwhelmed by the sheer volume of “incoming” information. This study shows that it’s more important than ever for producers of knowledge about philanthropic practice to share findings with their audiences in easily accessible formats across multiple channels that maximize the benefits of informal and formal sharing. Funders say that when time allows, they sift through email for relevant topics – but sometimes they manage the firehose of information by just ignoring or deleting inbound e-mail. This is likely another explanation for why funders turn to peers – as curators of information. Similarly, the interviews surfaced that foundation board members largely rely on their foundation’s professional staff as information sources and curators. Most board members do not try to consume the firehose of practice knowledge directly. Typically it is not the knowledge product by itself that leads most foundation staff and board members to adopt a new idea or practice, but a number of factors that lead to consideration and application of knowledge, including chiefly, new senior leadership and a shift in the external environment.